This post is the conclusion to an experiment about having no desk at work. After a month of not having a permanent desk I want to reflect on the experiment. Here is how my hypothesis stacked up. I was able to get enough data on this to prove my pointIn total I sat in 12 different places during the 23 working days of the experiment. 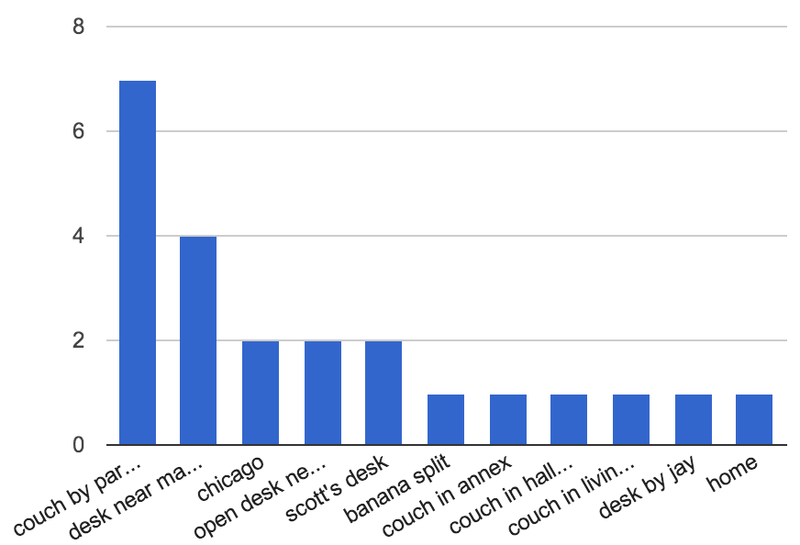 Of those places, the most common was a couch in the corner of the office that I sat at on seven different days. 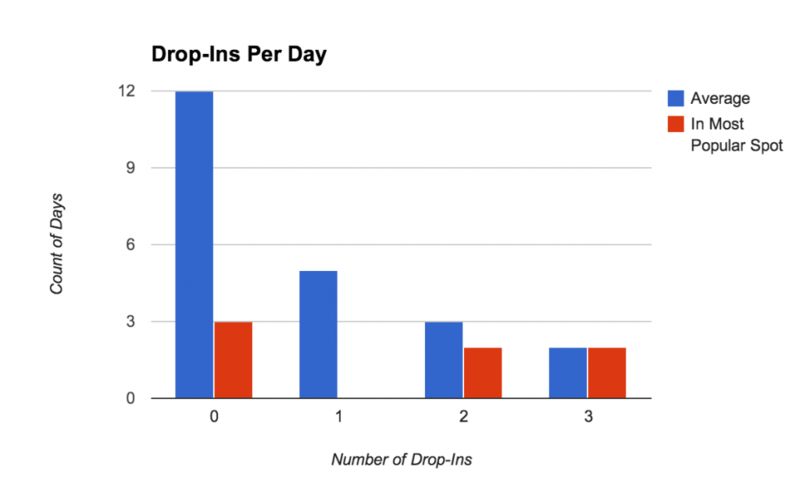 My average daily drop-ins was 0.78. However, when I started to develop a favorite, people began to know where to find me and the drop-in rate climbed to 1.43. Graphically, here are we can see the number of days I had each count of drop-ins. The highest counts were only achieved on days where I was sitting in a spot people knew I was often in. Additionally, I asked people what the first method they would use to get a hold of me was & what they thought the most effective method was. I then grouped those responses into two categories; desirable and non-desirable. The desirable ones were asynchronous – chat, email, text & carrier pigeon. 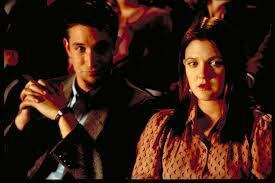 The non-desirable ones were synchronous – in person, drop-in, turn & chat, smoke signal, etc. The control responses showed that the method they would use to first get a hold of me were the methods to my liking only 54.5% of the time. The methods they recognized as the best way to get a hold of me were to my liking 91% of the time. Basically, people knew how to get a hold of me effectively and they knew that my preferred methods were the most effective – despite that, they still dropped-in. After the experiment, the responses showed that people’s selected first attempts lined up with my desirable methods 71.4% of the time. Basically, they already knew how to get a hold of me, but the experiment helped force an implementation of that. Accepted. As I moved around, I had less drop-ins. I haven’t yet compared this to a base line, but I am confident based on what I saw. The easiest way to prevent drops ins is to continually change up where you are found. As stated above, during the 23 working days of the experiment I sat in 12 different places. I sat in the most popular spot 7 times.The top two spots actually account for 50% of the days. I clearly started to settle in some.I think this reflects my nature – I tend to look for efficient pathways and develop patterns around them. I did notice however that those patterns started to change over time. In the short time frame of this experiment it was hard to detect that. Anecdotally, I noticed that as new desks were put near my favorite spot, I started to favor it less. This leads me to believe that even though there were patterns, those patterns were more fluid than a permanent desk location where I might have stayed put.Not having a permanent home meant that I was flexible, even if sometimes that flexibility appeared to be a pattern.One thing I did notice though is that I skewed back towards a desk as opposed to other forms of work station. In the first half of the experiment I only sat in a desk twice. During the second half I sat in a desk seven times. Accepted. Though the data shows I tended towards a few spots, the pattern of sitting in those spots was not one of slowly settling in. Towards the end, as the office layout changed a bit with a few new hires coming on, I rapidly adjusted. I used a survey to measure this. I asked the question “On a scale of 1-10, how satisfied are you with how often Greg is available to answer questions”My control resulted in a satisfaction level of 8.9. The result for the time of the experiment was 8.66. Based on the sample size & the population of people I interact with on a daily basis, this does not reflect a significant drop. Essentially these are indistinguishable responses. Accepted. My co-workers did not feel that I became less available during the survey. Accepted. I think in general I tend to be happier not having a permanent workstation. I am going to stick with not having a desk. It doesn’t have a measurable negative affect on my performance or availability to co-workers and allows me a bit more flexible. I have noticed that I am tending towards desks more than couches, which I think is fine, I will probably continue to do so. There are currently a few open desks in our office, so I am going to keep rotating.